This Friday from 7-9pm at Artisphere is the opening night for Think With Your Hands, a pioneering augmented reality presentation of illustrations by renowned Spanish graphic designers Pep Carrió and Isidro Ferrer. Anyone interested in art and technology should attend this exhibition. Rosslyn has an illustrious history of traditional journalism. But don't be mistaken, Rosslyn also has action at the cutting edge of media technology. Three actors voice the dozens of characters, a Foley artist creates all the sound effects, and a pianist plays a cinematic score, while more than 1,250 individual full-color hi-res comic book panels tell a hilarious sci-fi adventure story visually from an enormous movie screen. And it’s all done live in front of your eyes. 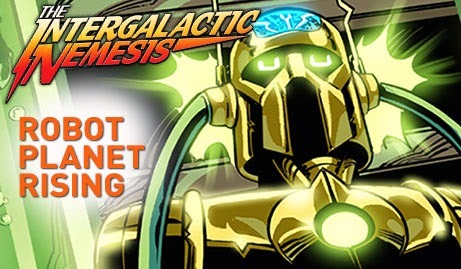 Intergalactice Nemesis is for all ages and for "the kid in everyone." As a wizened journalist once counseled a cub reporter, "You're only young once, but you can act immature your whole life."